When you live quite a ways away from the nearest airport, you have to make some alternative arrangements. After we return from Memphis, Gerry and I have chosen not to embark right away on a six hour drive home,. We'll be getting in later that day and relaxing is what we'll want to be doing. We will be gathering our strength and recouping from our vacation for one night at Four Points Sheraton Saskatoon. 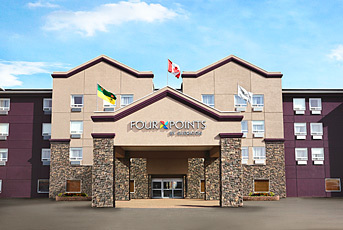 Four Points Sheraton hotel is in a great location, in the beautiful Saskatoon, Saskatchewan. There is a 24 hour front desk, which is pretty convenient for those arriving late or departing early. The facility also includes a fitness center for those trying to stay healthy while travelling. The pool facility even offers a salt water pool, a hot tub and a water slide. There are so many things in this hotel that make your travel experience just a little bit better. For example there is ample free parking as well as complimentary high speed internet connection in all the guest rooms. 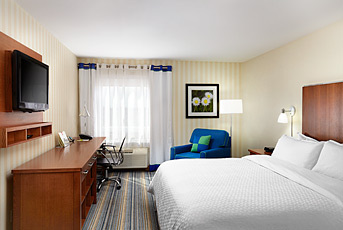 Speaking of guest rooms, comfort, relaxing atmosphere and cleanliness are some of our top priorities when travelling. The rooms at Four Points Sheraton are pristine offering a new white linen standard and have some amenities that are important to all travels, after all who packs a hairdryer these days. There are also two restaurants in the hotel and many popular restaurants in close proximity. After a night’s rest there we will be able to tackle our drive back home. We are looking forward to our visit with you Four Points Sheraton Saskatoon!